RM Contracts are a roofing & building company based in Harrogate, North Yorkshire. We have specialised in domestic and commercial roofing and building projects in Harrogate for over 25 years and have built a fantastic reputation for offering a first class service to all our customers. We will happily work on any roofing or building job you may have, so why not get in touch today and see how we can help. Whether you need your roof repairing or are considering expanding your home by building an extension we have the expertise to deliver the work on time and on budget. We are proud members of the Guild of Master Craftsmen, the Confederation of Roofing Contractors and Checkatrade giving you total peace of mind that we will work to the highest standards and deliver the work at a fair price. 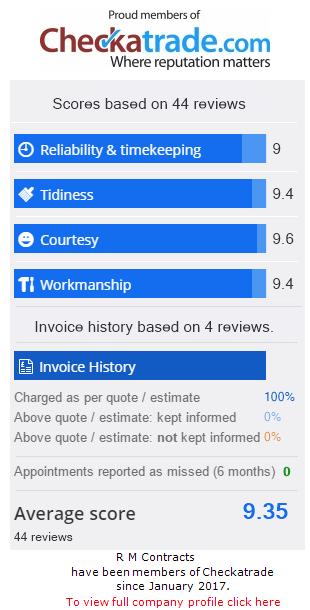 RM Contracts is a Harrogate based company with a reputation for high quality workmanship and fantastic customer service. RM Contracts is a local firm of roofers and builders specialising in a wide range of domestic, commercial roofing and building projects. From re-roofs, roof repairs and GRP flat roofs through to house alterations, extensions, and loft conversions. Our team of time served tradesmen are ready to help you transform your home.